The Revillagigedo Archipelago is a relatively unknown group of islands located approximately 300 miles southwest of Cabo San Lucas. 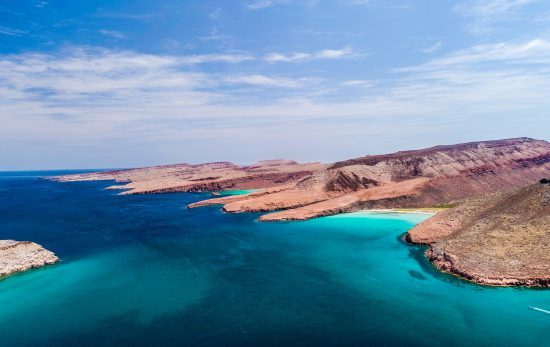 Sometimes referred to as Mexico’s “little Galapagos”, this volcanic island chain was recently declared as Mission Blue’s newest Hope Spot, as it is most definitely a unique area of the ocean critical to the health of our blue planet. This remote archipelago is made up of four islands, Socorro, Clarion, San Benedicto, and Roca Partida, each of which are actually the peaks of volcanoes rising as high as 13,000 ft (3900m) above the ocean floor. Part of a larger group of underwater mountains and volcanoes, this formation, in conjunction with the North Equatorial current and the California current, create an incredible amount of upwelling of nutrient rich waters that supports a diverse array of marine life. San Benedicto Island rises out of the Pacific Ocean, with it’s tallest peak more than 1,000 feet (300m) above the surface of the ocean. Photo By: Kip Evans. Revillagigedo is known throughout the global scuba diving community as one of the best places in the world to dive with ocean giants. 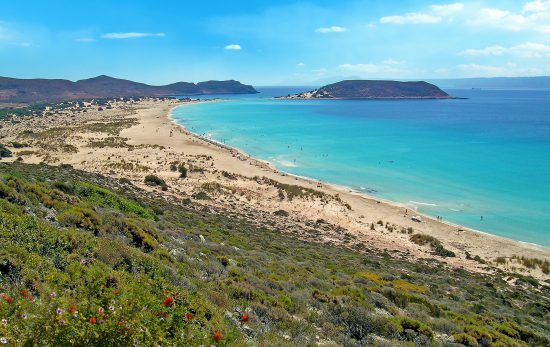 With such nutrient rich waters, this region acts as an open ocean waypoint for a myriad of large migratory species of sharks, whales, dolphins, tuna, and sea turtles. Hammerhead sharks, whale sharks, humpback whales, and oceanic manta rays are just a few of some of the most commonly seen ocean animals in the archipelago’s surrounding brilliant blue waters. 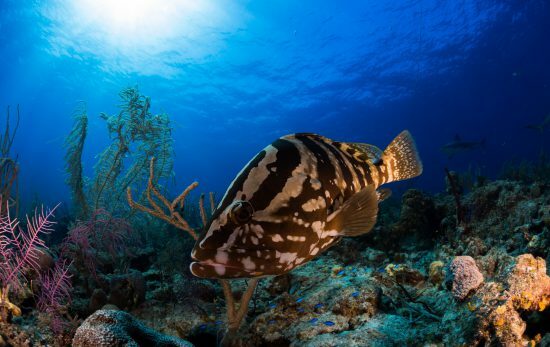 These islands are also home to biodiverse coral reefs, providing habitat for approximately 366 species of fish, 26 of which are found only here, as well as four species of sea turtle. 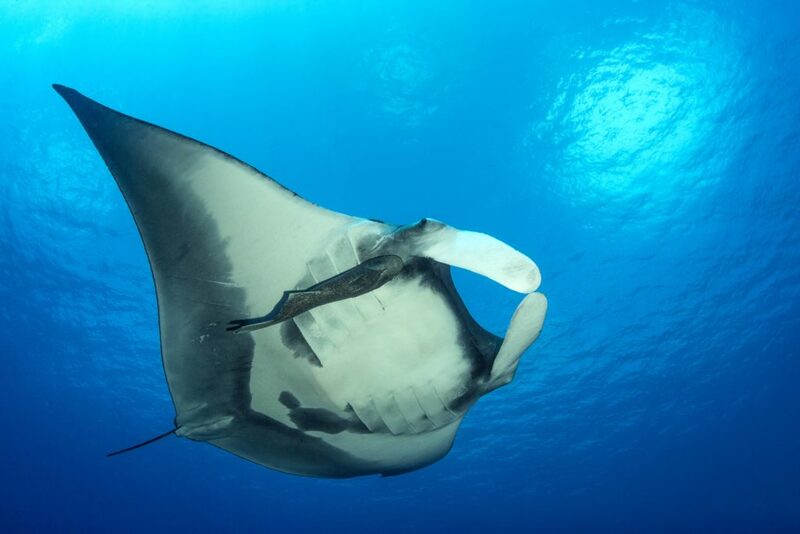 Roca Partida, Revillagigedo Archipelago’s smallest island, is home to one of the world’s largest populations of Giant Oceanic Manta Rays. Photo By: Kip Evans. Another reason this group of islands is so abundant with marine life is that fortunately it has a history of protection. Since 1994, this chain of volcanic islands and the waters directly surrounding them have been declared a Mexican biosphere reserve. And in October 2017, 148,000 square kilometers of ocean surrounding the Revillagigedo Archipelago was designated by the Mexican government as Revillagigedo National Park, making it the largest fully protected marine reserve in North America. Shortly before that monumental designation, in January 2017, Mission Blue led a Hope Spot Expedition to the Revillagigedo Archipelago in partnership with Fins Attached in order to bring awareness to the need for increased protection there as well as highlight the importance of shark science and conservation in the area. Despite so much protection, sharks and rays throughout the Mexican Pacific and Gulf of California are highly threatened by commercial fishing operations that either directly target sharks for their fins and meat or accidentally catch them as bycatch while targeting fish like tuna. 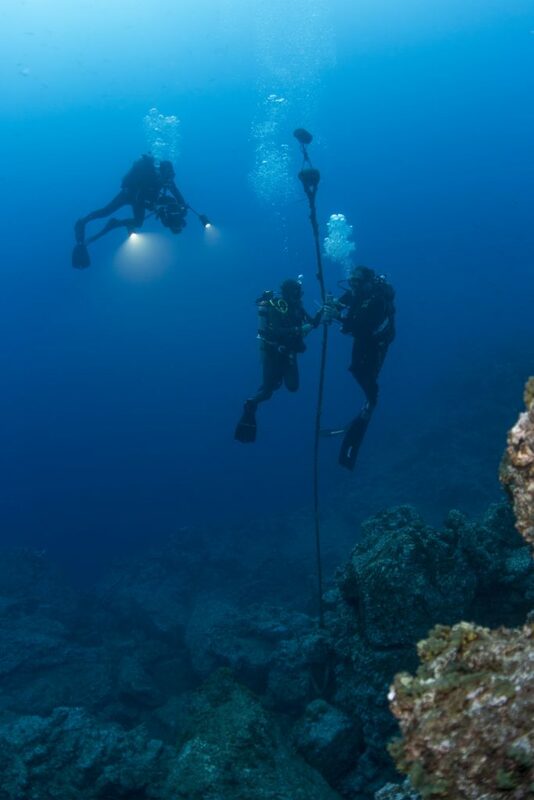 Mission Blue Expedition team members and scientists retrieve an underwater acoustic receiver full of shark data and replace it with a new one. Photo By: Kip Evans. In order to highlight the importance of shark science and conservation here, during their 2017 expedition, Mission Blue set out to better understand the movement patterns and migration routes of the sharks that use Revillagigedo Archipelago as an ocean corridor. With underwater acoustic monitoring devices, the expedition team was able to collect vital data about the behavior of these sharks to help inform shark conservation efforts. 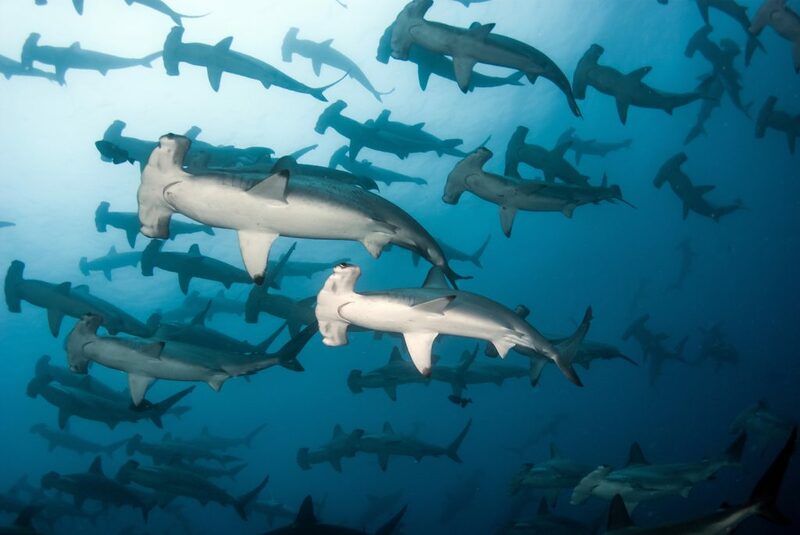 The connectivity between Revillagigedo and the Gulf of California, the broader Mexican Pacific, the Galapagos off the coast of Ecuador, and Cocos Island off the coast of Costa Rica, stresses the importance of establishing strong protections for the sharks that pass through this network as well as all the other incredible marine megafauna that use this area as a stepping stone. “It’s very important to collect these data because we want to know how much these animals are using the marine reserves.” -Dr. James Ketchum, Fins Attached lead scientist during Mission Blue’s 2017 Revillagigedo Hope Spot Expedition. 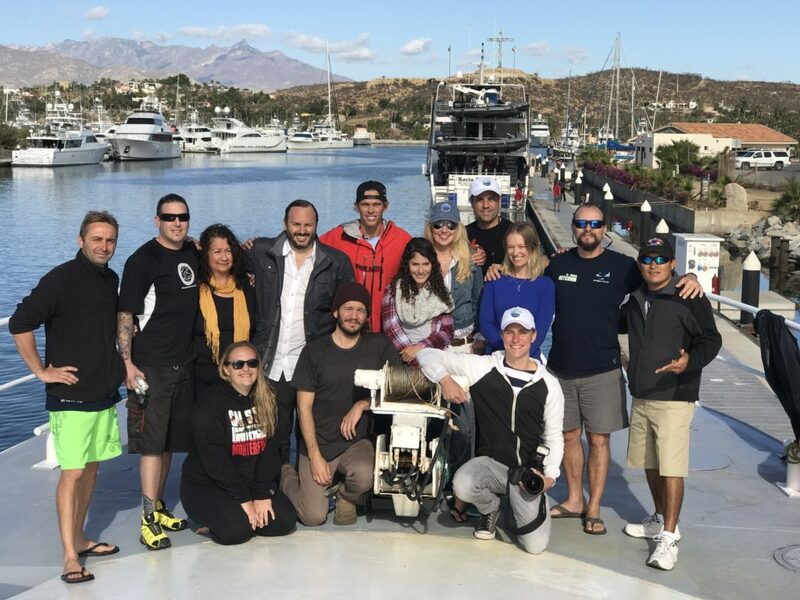 The Mission Blue and Fins Attached Team during the 2017 Revillagigedo Archipelago Hope Spot Expedition. Photo By: Kip Evans. 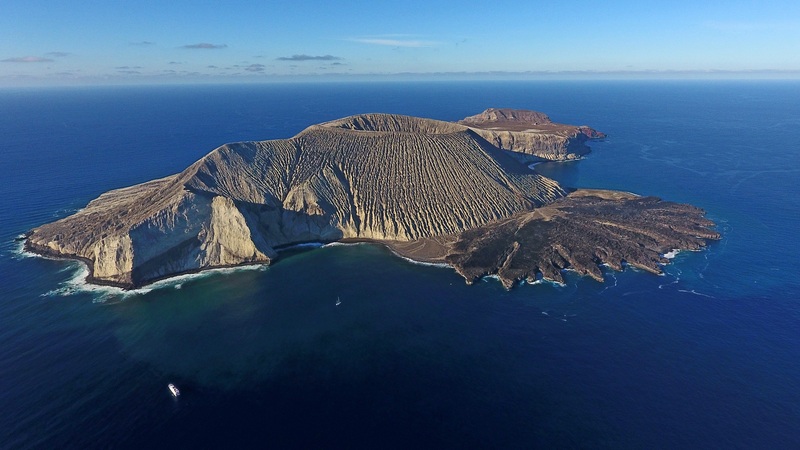 Despite pressures from overfishing in the area, the work of organizations like Mission Blue, along with conservation-minded Mexican government officials, and simply the awe inspiring underwater ecosystem that surrounds these four volcanic islands, the future looks bright for the Revillagigedo Archipelago. 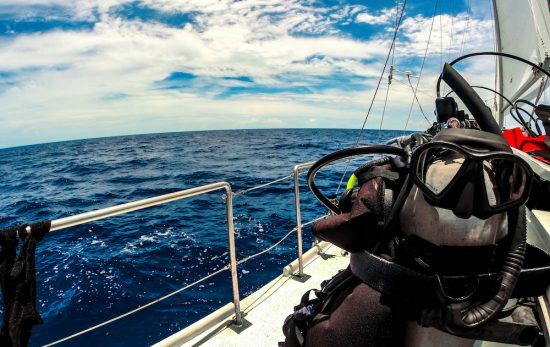 Want to join Mission Blue in their efforts to create a network of Hope Spots around the world? 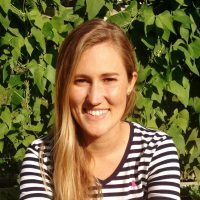 Visit the Hope Spots page on their website to learn more about existing Hope Spots and how you can actually nominate an area of the ocean that is special to you. 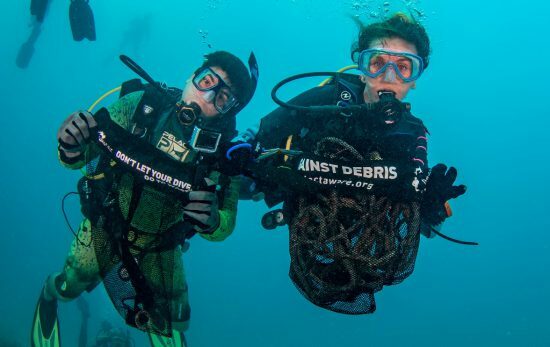 PADI is proud to partner with Mission Blue; learn more about how we’re working together to protect our precious blue planet here.